If Donald Trump’s new buddy, Mitt Romney, is elected president, the developer can visit him from his new hotel just four blocks away from the White House (and twelve blocks from the Capitol). The Government Services Administration has just announced that it will be turning over the grand late 19th century Old Post Office Building to Trump. No one cared, it looked dirty, the squat brooding columns of its portico were caked with black soot; and in the evening tired government workers wait in front for the buses to take them to their manicured lawns across the bridges in Virginia. Of course, when it's hot, or it rains the shelter of its broad, deep arches are welcome; but the day was bright and the building looked grey and uninviting. In fact, that was just what the Pennsylvania Avenue Commission had proposed six years earlier. But Don’t Tear It Down and John Wiebenson, who would soon join the Gazette to contribute what was then the only urban planning comic strip in America, would have none of it. Aside from agreeing on the principles, I had another reason to be fond of the building. 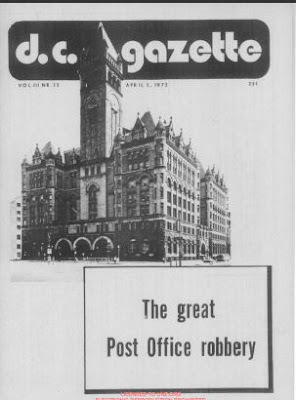 Over a decade earlier I had gone there as a radio reporter to interview an Assistant Postmaster General after news broke that his agency was blocking the delivery of some magazines. His office was the grandest I had seen in Washington short of the White House. He directed me from his desk the grand distance across the room to two immensely comfortable leather chairs under church sized windows. As I sat down, I noted behind his chair a large, messy pile of girlie magazines, playing, I assumed, the dual role of evidence and distraction. That memory would return many times as I dealt with the inconsistencies of public officials. |||| The Post Office currently provides the government with over 215,000 square feet of office space With normal maintenance it can continue to serve as an office building. Restoration to its original elegance would cost less than 25% of the cost of the proposed IRS building and would provide over 60% of the space of the new building. In the end, the building was saved and the city’s preservation movement gained a life that would last for decades. The only problem was finding tenants and it was this frustration that ultimately led to its most recent and most ironic change. 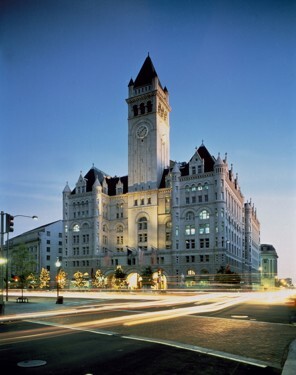 I don’t begrudge it, though, because, when you think about it, having Trump in the Old Post Office is far better than it would have been to have the Old Post Office in the dump.